Come celebrate our nation's birthday as a German family and their friends would have done in the early 1900's at the LBJ State Park in Stonewall from 10 am to 3 pm. Take part in activities such as horseshoe and washer pitching, stick-horse races, watermelon seed spitting and other games. Please call 830/644-2252 for more information. 1:00 p.m. - Parade down Main St.
2:15 p.m. - 4th of July Patriotic Program with music at the Marktplatz on Main St.
7:00 p.m. - Concert with Air Force Band of the West at Lady Bird Johnson Municipal Park, Hwy 16 S.
9:15 p.m. - Fireworks at Lady Bird Johnson Municipal Park, Hwy 16 S.
Roots Music is a series of live, open-air concerts on the grounds of the Pioneer Museum on Main Street in Fredericksburg, Texas. Concerts feature both emerging and established artists in an informal, family setting. June 26 is Americana Rock Night. 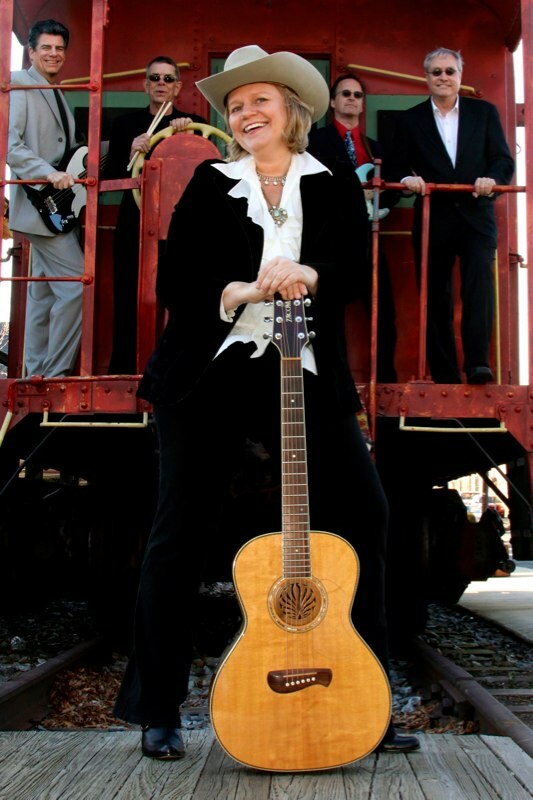 Playing high energy roots rock and Americana, Ruthie & the Wranglers do everything from country to surf instrumentals to hillbilly harmonies. Based in Washington, D.C., the group has won that city’s top music awards 25 times. Everyone has heard Two Tons’ “rambuctious” brand of country rock by now. Declared by producer Lloyd Maines as “one of the best bands in Texas,” Two Tons has appeared on the Grand Ole Opry eight times, toured Europe, and topped the American Music Charts. Longhorn Street Cafe will serve choice of 12 oz. rib-eye charbroiled and cooked to order on site; Charbroiled chicken breast; Charbroiled shrimp –on-a-stick; sides of dinner roll, butter, and any two of the following: wild rice, green beans almondine, or mashed potatoes, plus dessert. $9. Tea, sodas, beer, wine and water will be for sale on the grounds. The Pioneer Museum is located at 325 West Main Street in Fredericksburg. Entrance on Milam Street. Free parking. All concerts take place on Saturdays, 6 - 10 p.m. Gates open and food is served beginning at 5 p.m Admission is $12. Students high school age and younger are free. Special! $2 off for advance online tickets, or bring web page printout to gate for $2 discount. Proceeds support the mission of the Gillespie County Historical Society. A special afternoon tea with activities for grandparents, parents and children aged 4 - 10 at Pioneer Museum, 325 West Main Street. Seating's for tea are at 10:00am and 1:00pm. Admission is $10 per person and includes museum admission. Reservations recommended. History and legends of our nations flag program followed by a program and demonstration of flag disposal by Boy Scouts at National Museum of the Pacific War's George Bush Gallery. The grounds of the museum will be decorated with near 5,000 flags placed by Boy Scouts and NJROTC from Fredericksburg. This program is free with standard fee for museum attendees. Please call 830/997-8600 for more information. Live music and fun and the overflow from Austin's Bike Rally in downtown Luckenbach, Texas. Artisans at Rocky Hill, 234 West Main, proudly showcases demonstrations in clay from 12:00pm until 8:00pm during First Friday Art Walk Fredericksburg. Throughout the gallery and in the courtyard gallery visitors will enjoy some of our most popular clay artists throwing on a wheel, carving, glazing, painting and hand-building. Demonstrators include Sherri Jo Adams of Boerne, Janet Csanyi of Comfort, Al & Jeni Hoeksema of Spring Branch and Anna Elrod of Austin. Refreshments will be served. Please join us for this very fun annual event as we showcase art in action by all of your favorite clay artists. This race will be a Texas Bicycle Racing Association (TxBRA) and USA Cycling sponsored road bicycle race. The start and finish will be in Doss, with 23 mile and approximately 30 mile circuits south of Doss, north of Highway 290 and west of Highway 87. The race is being sponsored by the Juvenile Diabetes Research Foundation, Hill Country Bicycle Works and Joe's Pro Bikes. There will be multiple races to include Men's Pro/1/2, Men's 3, Men's 4, Men's 5, Women's Open, two junior races and two men's masters races. The Admiral Nimitz Foundation and the National Museum of the Pacific War, 340 East Main Street, will host films in commemoration of the Battle of Midway, WWII. Movies are free, with admission into the museum. Call (830) 997-8600 for more information. Summer Showcase at InSight Gallery, 244 W. Main Street, features artists Rosetta, Aleksander Titovets and Lyuba Titovets. Call (830) 997-9920 for more information.